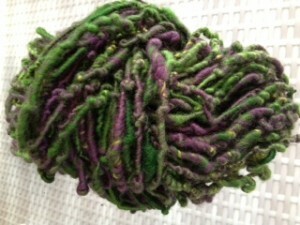 Remember this funny curly hand spun I produced a little while ago for a bit of fun . Well it knitted up beautifully. You would think I used elastic its so stretchy, if you pull it out, it just bounces back again. 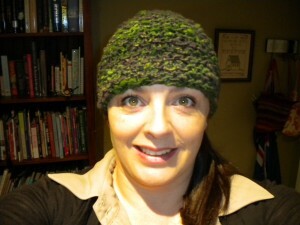 I knitted my Mother in Law a hat for her Birthday, she lives in country Victoria and the winters there are freezing, so it’s perfect for keeping her little head warm. I currently have only two other colours of the Curly Whirly hand spun in my shop, so be quick if you would like to be the first to try it out. I will be spinning up some more as they are lots of fun to spin and knit up.